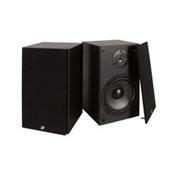 For use in ANY indoor audio application, the Dayton B652 bookshelf speakers deliver great sound at an affordable price. Perfect for offices, dorm rooms, man caves, garage workshops, apartments, or any other living area. Measuring in at under 12" tall, these small but mighty bookshelf speakers will never overwhelm the decor in any room. The two-way design features a 6-1/2" polypropylene cone woofer and a 5/8" polycarbonate ferrofluid cooled dome tweeter to accurately reproduce audio from 70 through 20,000 Hz. Complement the low-end with a Dayton Audio subwoofer for an audio experience rivaling many high priced speaker systems. Installation features include quick connect speaker terminals and key-hole hanger. Removable grill. Specifications: â€¢ Woofer: 6-1/2" polypropylene â€¢ Tweeter: 5/8" polycarbonate ferrofluid cooled â€¢ Power Handling: 40 watts RMS/75 watts max â€¢ Impedance: 8 ohms â€¢ Frequency Response: 70-20,000 Hz â€¢ Sensitivity: 87 dB 1W/1m â€¢ Dimensions: 11-13/16" (H) x 7-1/16" (W) x 6-7/16" (D) â€¢ Sold in pairs. I really like these speakers. I am retired and because of an accident, I am confined to my home. I wanted something to hear with my CD Collection and thse speakers really fit the bill. I use these speakers with a 50 watt Monoprice tube amplifier and could not be happier with the sound that I get from these speakers. I have a Solid State NAD receiver in the Family room with floor standing B and W speeakers and I prefer this setup to that one.